March 27, 2013 - DLE-TEST19 : Here a new very interesting experiment that I have conducted with my test platform dedicated to the study of the Delayed Lenz Effect (DLE-TB v1.0). This experiment has suggested me some new hypothesis. use ferromagnetic core made with soft iron, steel or better with a nanocrystalline material. 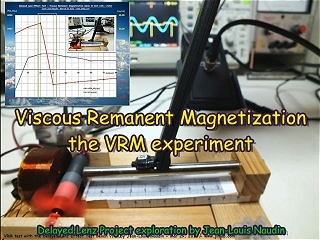 Is that the effect of the acceleration of the rotor (delayed Lenz effect) is produced by the ferromagnetic medium itself and not by the coil ? 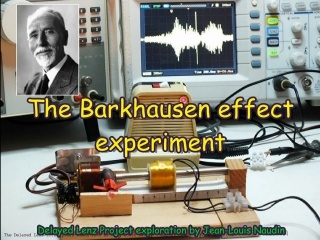 "The Barkhausen effect is a name given to the noise in the magnetic output of a ferromagnet when the magnetizing force applied to it is changed. Discovered by German physicist Heinrich Barkhausen in 1919, it is caused by rapid changes of size of magnetic domains (similarly magnetically oriented atoms in ferromagnetic materials). Barkhausen's work in acoustics and magnetism led to the discovery, which provided evidence that magnetization affects whole domains of a ferromagnetic material, rather than individual atoms alone. The Barkhausen effect is a series of sudden changes in the size and orientation of ferromagnetic domains, or microscopic clusters of aligned atomic magnets (spins), that occurs during a continuous process of magnetization or demagnetization. The Barkhausen effect offered direct evidence for the existence of ferromagnetic domains, which previously had been postulated theoretically. Heinrich Barkhausen discovered that a slow, smooth increase of a magnetic field applied to a piece of ferromagnetic material, such as iron, causes it to become magnetized, not continuously but in minute steps." Source "Wikipedia : The Barkhausen effect". Does the synchronized back and forth avalanche of the magnetic domains (like a wave in a tank) is the cause of the inversion of the effect Lenz of the core placed in front of rotating magnet ? This would explain why this would occurs at a specific distance from the end of the core to establish a steady magnetic wave therein. The synchronized avalanche of the magnetic domains caused by the fall of the first domain, which then causes the other step by step (like falling dominoes ...), can be here an extra free energy source ? Below, some photos of the experiment. The excitation coil and its controller are not used here. The secundary coil is connected at the input of a high impedancee phone amplifier. 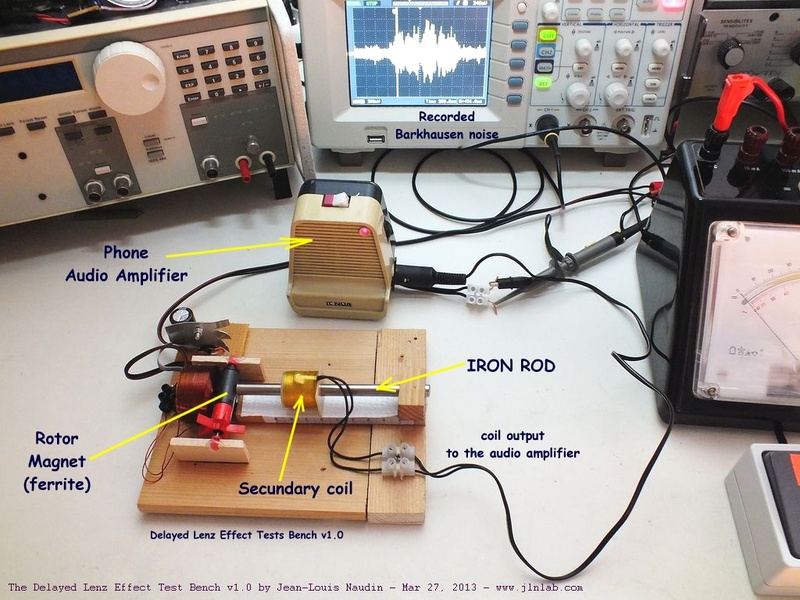 This phone amplifier is used to magnify the Barkhausen noise produced by the motion of the magnetic domains in the ferromagnetic core. 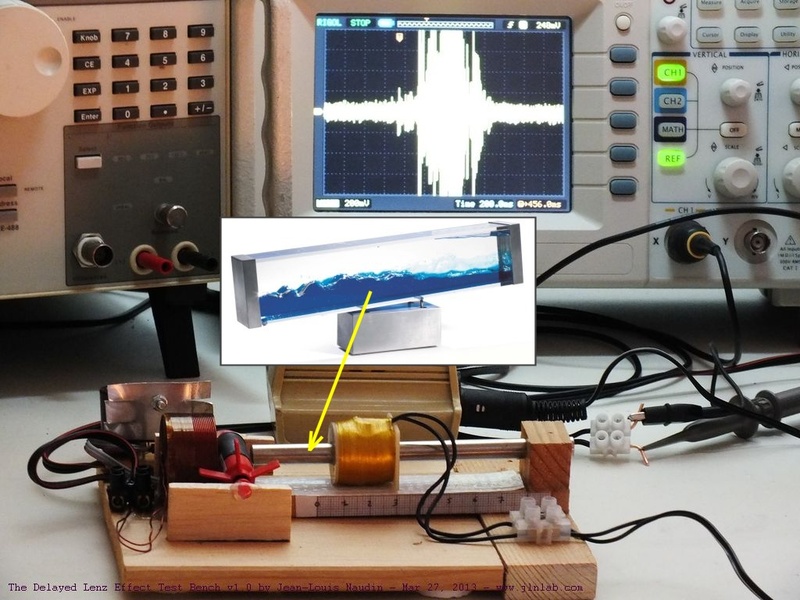 This experiment has fully demonstrated that the effect Barkhaussen is present in the ferromagnetic core of the coil. 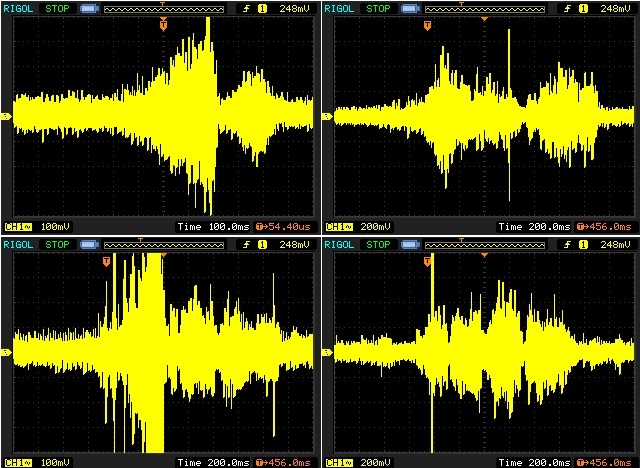 A very characteristic audio noise can be heard when the rotor is rotating slowly by hand, this special noise is also measured with the oscilloscope.